Shopping local is an emerging trend us Gold Coaster’s have taken on-board vehemently and vigorously and you will find a good majority of us perusing the weekend markets bound to find a bargain and filling our baskets to the brim. There is something so refreshing about chatting to the person who grew, produced, or sourced the product you are buying. 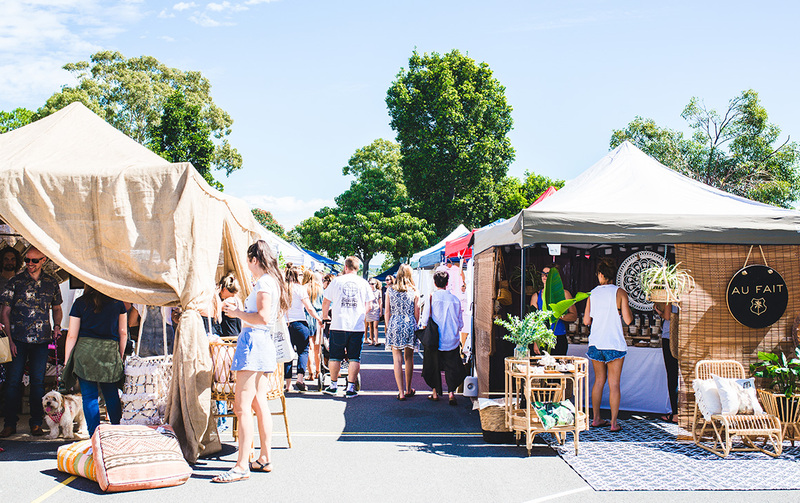 So, with that in mind, we’ve got a bucket list of the best markets on the Gold Coast; the perfect way to spend the next few weekends, no matter your preferred market style. Handcrafted wooden skateboards, adorable kidswear, floppy felt hats, babes on push bikes—who needs Bondi when you’ve got The Village Markets? Since 2008, “TVM” has been silencing skeptics of the Gold Coast’s blossoming talent pool with their artfully selected round up of boutique fashion and lifestyle stalls. Trading on the first and third Sunday of every month at Burleigh Heads State School from 8:30am until 1pm, TVM’s famous “positive Sunday vibes” are always a winner. Marvel at emerging designers, creatives, and collectors; listen to live music; and eat delicious food, ‘cause this little gem—hands down the best markets on the Gold Coast—is what life in this corner of the world is all about. Amen. An incredible feast of mix and match eats, all within a shipping container city, NightQuarter is a unique blend of food, community and culture, and a fun festival for everyone. By far Gold Coast’s top live music venue, The Paddock brings both emerging local artists and some of the country’s top touring acts to the barn-styled stage. With six bars and different foodie precincts, you seriously won’t know where to turn. Tapas Street is a fairy light-filled space and is reminiscent of Mediterranean back alleys where the ethos is shared eating and shared conversation. The Backyard is your new local, inspired by everything Australian. You will feel like you are in a shearing shed or outback pub where the BBQ is available to cook-your-own steak. Don’t forget the desserts, ice-cream cookie sandwiches, cute cupcakes and crazy cronuts, caramel-coated popcorn and mountainous milkshakes. You will need to go every Friday and Saturday night for the next year to try everything on offer…We just might! 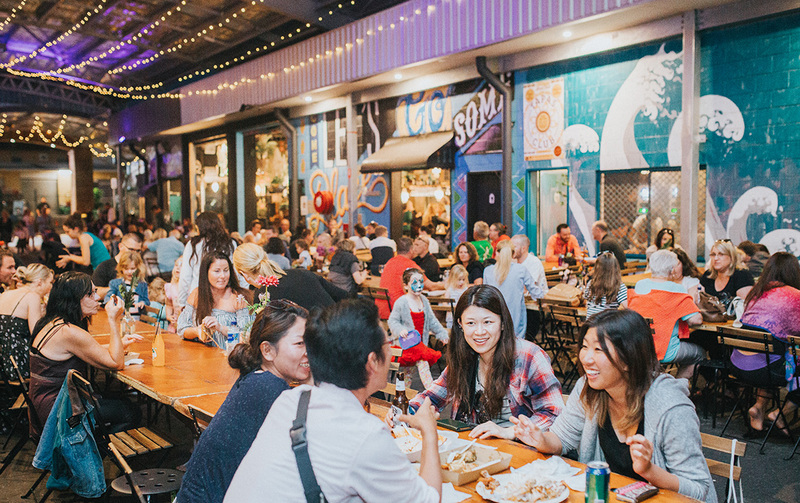 Casually offering up an oyster bar and gluten free doughnuts like it ain’t no thing, the Miami Marketta street food market is a frenzy to the senses and a faultless example of our deep-rooted multiculturalism. Watch the passion poured into flaming souvlaki and the rigour of flipping a batch of paella before sailing into the sinful “dessert hall”. We should expect nothing less from a venue that hosts UB40, The Cat Empire and weekly tapas club nights. The Miami Marketta street food market is served up over blues, jazz or flamenco music on any given Friday or Saturday night of the month. If you are the kind of person that wanders markets and are quickly thereafter thinking “what now?” then The Social Markets might be your style. These night markets offer FREE barefoot lawn bowls all night long to keep you entertained. 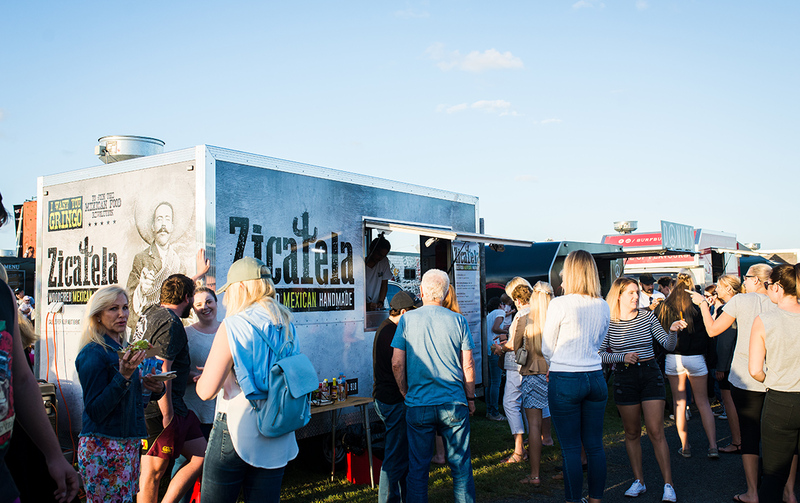 There is also live music, lots of liquor including cold beers and killer cocktails, the Gold Coast’s best food trucks and plenty of arts and craft stalls. Even if you are on babysitting duties, there are jumping castles, face-painting, and all round fun for the whole family. On every second Saturday from 4pm to 9pm at the Mermaid Beach Bowls Club, it’s the perfect time to watch the sun go down. Follow their Facebook page to stay up to date on who is behind the tunes and food. Let the good times bowl! Disclaimer; The Design Collective Markets is NOT your everyday crafts market with knitted tea cosies and grandma’s fancy fudge. Think more along the lines of gourmet food trucks, vintage market sellers, and an epic caravan renovated into a stage to showcase local musicians and performers. Owned by two creatives, Matt and Kat go all out for their events and are therefore “pop-up only” and very sporadic, which makes them all the more exciting to attend. 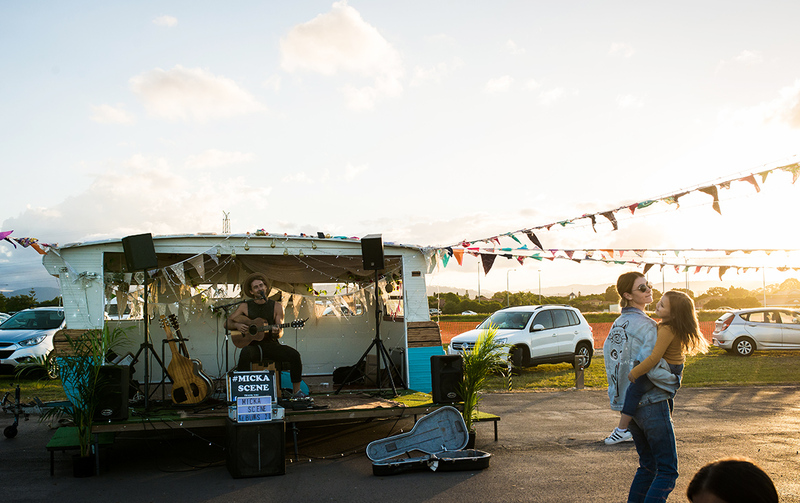 From twilight markets in Tweed, to Miami Shark Bar rooftop shindigs, atop Tamborine Mountain, and their newest addition the Eat Make Grow twilight markets, as well as everything in between, there is only a guarantee for a great time and lots of community spirit in mind. Held monthly, at The Green Marquee Eco Twilight Markets expect all the feel-good community vibes as you wander around market stalls adorned with handmade jewellery, recycled clothing, ceramics, vegan skincare, hanging plants; plus delish food trucks, live music to get you grooving, fresh produce from Ground Grocer, coffee and cakes from Pasture & Co., activities for the kids, plus local brewskies from Black Hops, Balter and Ink Gin for the adults. The Palm Beach Farmers Markets are a Coast favourite, close to the beach, and often have up to 80 stallholders offering their wares. Well known for Mio’s Buckwheat Crepes, you will never get to this stall without a winding queue due to the nutritional punch these colourful crepes of goodness offer. The Brownie Hut makes everyone’s day with the standard indulgent square of goodness, as well as a gluten free option AND a vegan option, while the crew at Bespoke Ice Cream have the cutest little bicycle cart serving up dairy free and sugar free ice cream so healthy you could eat it for breakfast. This is one you need to visit on repeat, (even if just for the smell of caramel popcorn) located at Currumbin State High School every Saturday from 6am to 11:30am rain, hail, or shine! If Burleigh is more your neck of the woods, then these markets could well be your new Saturday ritual. With freshly-picked flowers to brighten your weekend, Flat Earth Kombucha on tap ready for re-fills, all natural and tasty falafels, gluten-free doughnuts for dessert, live music to sway down the aisles to, and beautiful cane baskets to take all your produce home in, it’s pretty much a one-stop shop. There is also a whole hall full of organic produce, a truly amazing atmosphere and a whole lot of gourmet global goodies. It’s hard to not swing past Burleigh Heads State School every Saturday morning from 7am to noon, to smell the aromas, sample the foods, and support the local community. One of the best markets on the Gold Coast, it truly embodies the spirit of local farmers, craftsmen, artisans, and producers where everything is served with a smile and a sense of pride. If you prefer your fruit n veg without copious amounts of sprays and toxins, then you should make your way to Queensland’s only truly organic grower’s market, selling only the best quality produce. Did you know that organic fruit, vegetables, and meat have 40 to 90 per cent more antioxidants than commercially-grown food? Us neither, but that coupled with completely affordable prices is a good enough reason to visit Miami’s Organic Farmers Market. Some weekends you’ll find community stalls promoting environmental awareness and natural health practices. So, if you want to get a little more educated on our planet and our produce, pop down and spin a yarn with one of the stallholders. Held every Sunday morning at Miami State High School between 6am and 11:30am. 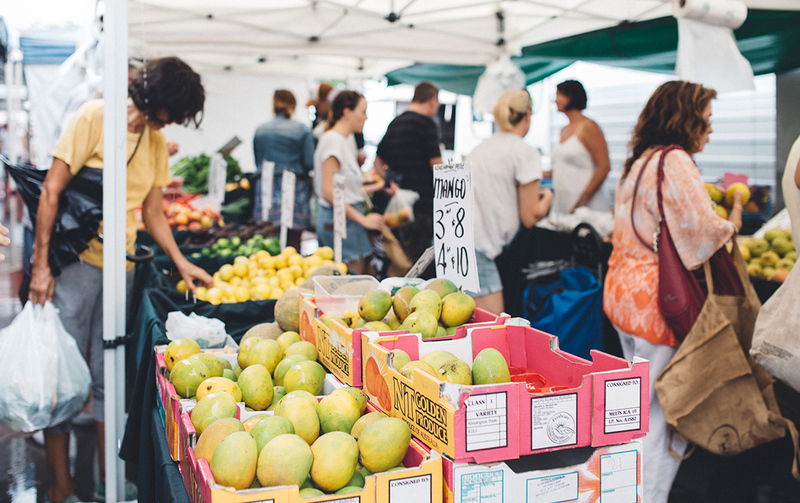 Strategically located at the entrance to Currumbin’s fertile valley—meaning a shorter distance from source to market—this boutique farmers market is certain to become your mid-week ritual. Held every Thursday morning, at the Currumbin Community Markets you can fill your basket with organic fruits and vege, meats, jams and baked goods, then stay for the breezy live music, picnic blanket hangs and activities for the little tots. One thing we will say about this spot in Carrara, is to go there as hungry as a hippo. From 3pm to 7pm every Thursday night, the village centre lights up and so will your eyes when you see what’s on offer. It’s certainly a carb overload with delicious cheeses, pizza, German hotdogs, waffles on a stick, crepes, and more French pastries than you’d see in the capital of France. Well, not quite, but you know what we mean. If fresh is more your flavour, then don’t fret, because these markets boast equal amounts of fruit, vegetables, and other healthy hits. If you don’t even need food, Emerald Lakes Twilight Market it’s still a lively spot to catch up with friends and enjoy the live entertainment and celebrate that’s it’s nearly the weekend! You know those days where you wake up thinking “I’d go to the markets if it wasn’t for the whole need-to-look-cute-and-be-sociable thing”? Those are the days to check out the Carrara Markets Car Boot Sale. Held every Sunday from 6am ‘til 9am, this extension of “Australia’s biggest market” is a swarm of vintage and homemade shopping goodness for those prepared to roll up their sleeves and have a dig. Operating regardless of weather and offering 100+ sites, you’re sure to nab a bargain and meet a few eclectic characters along the way. Made your way to one of the best markets on the Gold Coast? You'd best be using this then.